V.com weekend vote: How high is your A? TwoSet alleges that some European orchestras are tuning as high as 448 hz, can anyone confirm if this is true? Is it Berlin? That kind of pitch escalation truly blows my mind! But apparently it is normal in some quarters, so I thought I'd see where everyone is putting their "A's" these days. When I was a student, 440 hz was very standard in the U.S., but over the years that has nudged higher. Currently in Los Angeles, the professional orchestras tend to tune to 442. Baroque orchestras, such as Tafelmusik and the Handel and Haydn Society tune quite a lot lower, to 415 hz, in order to be as historically accurate as possible. All that said, some church organs are such that one has to tune down into the 430s. In all likelihood, your pitch varies by the situation, but for the majority of the time, how high is the A tuned on your violin? December 15, 2017 at 09:07 PM · 440Hz unless I'm playing folk or doing a period performance. I personally hate tuning up to 442Hz, but I've had to do it a few times for local community performances. December 15, 2017 at 09:37 PM · 443 Hz, but not by choice. I have lessons in a music school which has its grand piano tuned that way. December 15, 2017 at 09:40 PM · In my orchestras in the UK we tune to 440, provided by the principal oboe or the CM if it is a string ensemble. In either case they get their A initially either from a tuning fork or from an electronic source. Some time into a rehearsal/concert it can become evident that the brass/woodwind are blowing sharp so we all retune to their A. If we get an A from the piano (as in piano concerto) then there's nothing that we can do if the brass/woodwind go sharp, except to hope that the audience doesn't notice. Choral works are a special case. Fortunately, we are blessed with conductors who are adept at keeping their choirs on pitch no matter what. Another special case is the soloist. If their intonation becomes variable then that's their problem and we do our best to keep ours steady so as to help. December 15, 2017 at 10:10 PM · I don't care what anyone says I'm tuning to 330... no wait, 430. Oops- 415. Darn it, 442. No, I mean 444. Oh heck, I'll just get by with 440 and see how that goes. In second thought, what's in a number anyway this ain't no math class. December 15, 2017 at 11:42 PM · For a time, Miss DeLay had her piano (in rm. 530) tuned to 443. She said it made violins sound "brighter". December 15, 2017 at 11:54 PM · I don't tune to any specified A. I either rely on my sense of pitch or tune to another instrument. December 16, 2017 at 01:26 AM · Reminds me of a gig I play'd years ago where the coloratura took her cadenza up a bit high..the conductor signaled us to be aware with short upward jerky motions of his thumb....then as she tired, the thumb pointed down...etc...we were all prepared for her and adjusted to her final choice of key center...tough to do on brass and winds.....but strings can make the adjustment....if they remain 'awake'. December 16, 2017 at 01:46 AM · 440 here. It's what I grew up on and has served me well -- plus part of me winces at the thought of stretching my strings much more taut than this. I can tolerate up to 442 but no more. And I don't like to go below 440. I'm OK listening to 415 groups like the H&H Society, because 415 is about a half-step lower than 440. So a piece in A Major sounds to me like A-flat. I myself don't tune that low, though, or play period instruments. BTW, some period groups adhere to 440, as long as they don't have a period piano in the ensemble -- can't stretch the strings that far, or they would snap. December 16, 2017 at 02:47 AM · 440 for me ... on the violin. I prefer a tuning fork and I only have a 440 fork. Now, on the viola, that's a different story because I play in a chamber orchestra where the director prefers 441 or 442. There I use an electronic tuner. December 16, 2017 at 03:03 AM · 442 seems to be de facto standard in Japan. When my daughter started playing I had no clue about pitch so we tuned her violin with an electric tuner with it's out of the box settings (440). Everytime we took a lesson, her teacher had to retune her violin up, and when we got back home we had to tune it down again. No explanation given - it was not until a month or so later we realized that it needed to be 442! December 16, 2017 at 03:25 AM · For those in the 443+ camp, how high are we talking about? And do we have any at 448? I have yet to meet someone who tunes to 448, but that could simply be a function of where I live. December 16, 2017 at 06:27 AM · My friend came back from Kronberg Academy wanting to tune higher; they tuned to something like 447 because that's the pitch level of the local organ. December 16, 2017 at 09:13 AM · At about the second minute of the video of Masterclass 4 a student is tuning to play only solo pieces. Heifetz insists on him tuning accurately to the piano A (which I hear as 442Hz) and says 'No compromise!' Is there any good reason why he insists on the current standard pitch for solo pieces? Perhaps he thinks that the violinist or the instrument's response and setup should be adjusted to a habitual pitch? December 16, 2017 at 11:29 AM · Following John Birchall.. I recently did a re-study of relative Hertz ( HZ ) pitch control. Importantly my root & primary sources (Helmholtz go back to the 1880's ).I found that other very serious scientific research & analysis-favoured slightly lower pitches-( more in harmony with overtones from Mother earths natural resonant frequency of @ 7.83 HZ, (all woods-metals & elements are in tune with this of course. 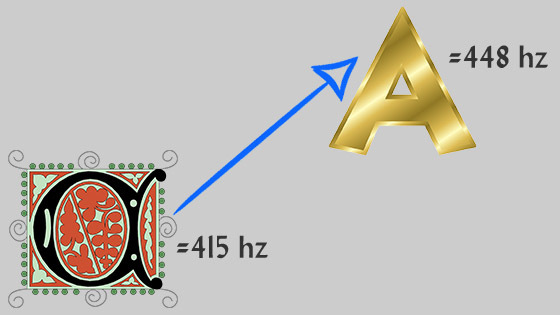 )It seems 432-442 was uptill early 50's when Concert'A' was fixed at 440Hz. I now find ( @ 13 Dec/'17) that a recent experiment (YouTube) where water was fed with a signal to resonate @ 442 Hz-displayed a most beautiful harmonious pattern, in stark contrast to when fed with 440Hz-when it was a non-descript mess. ? ?,so my immediate feeling was Yes yes yes,..we must be in tune with nature,(but how Jasha Heifetz could be so certain one can only guess) Curiously (altho Viola)-my other inst' includes Jazz gtr- & have noted over 50yr period many folk artists in 60's tuned & favoured the low D ( DAD GAD) on gtr- & many thousands of Solo jazz guitar players world wide,now prefer whole instrument,de-tuned,(Not: E ') but Eb-or D & even C#. Instruments sing better,harmonics & overtones resonate beautifully,..so Orchestral musicians ( Bless them all )could be made aware of this for their own study & simple experiment. Should not Concert 'A' be re-set at 432Hz.In tune with nature? Nearly all modern digital tuners have the facility to produce A ='432'. December 16, 2017 at 02:52 PM · We are at the mercy of the people who tune the keyboards. In the SF Bay Area, more likely 442. December 16, 2017 at 03:20 PM · A possible issue with those Heifetz masterclasses, and other recordings of the era, is that the playback speed on today's equipment might not be the same as on the original recording, with a consequent change in observed pitch and speed. I can understand Heifetz's insistence on tuning from the piano, which is used for accompaniment in most instances, so that there is a level playing field. The problem is that if the violinist tunes to "their" pitch for a solo piece then they will have to retune to the piano later. It takes a while for a violin to settle after tuning to a different pitch, and you can't have that sort of thing in a TV studio that may be going out live on air. December 16, 2017 at 03:25 PM · Wow! This is all new to me! As a beginner (7 months) I had no idea the pitches could change and everybody would be fine with it. I just tune my violin until the digital tuner is green and leave it at that. However, this opens up an amazing Pandora's Box of possibilities. If anything, next time my teacher says I'm a bit sharp or flat, (a somewhat frequent comment, although less frequent than it was a few months ago) I'll just say it was an artistic choice. That should work, right? December 16, 2017 at 03:44 PM · My violin has been at 440 for years, but many musicians at my music school tune to 441. The small difference makes a brighter, fuller sound. I still go back and forth on the issue. December 16, 2017 at 07:28 PM · Could someone please recall the original reason why modern orchestras have gone to slightly higher tuning? I once asked our conductor about it, he said that it makes it easier on the wind instruments, but I forget why exactly. December 16, 2017 at 10:02 PM · What constitutes a correct "A" is not something divinely dictated. It is "fashion" and more about what we are used to. I was at a concert a few months back where all the members of the string quartet were playing instruments that had been returned to "original" dimensions and fit with gut strings. All tuned to the lower Baroque pitch of about 415. Playing together it sounded fine and coupled with the lighter touch of the convex bows softer and gentler. Quite different from the same music played by another quartet playing on modern size instruments with mostly synthetic core strings and concave bows. Both are fine, just different interpretations of how the music should be played. In the end it is just whatever fashion you prefer, or the group you play with prefers. December 17, 2017 at 07:25 PM · When I tune to A440, my open G often sounds flat relative to my stopped notes. Tuning to A442 seems to correct the issue for me. This issue is a probably specific to my violin and my technique. As one of the original 7 pupils of Jascha Heifetz, & having made one of the half hour films with Mr. Heifetz, in his Jascha Heifetz Violin Master Classes at USC, filmed on campus by NYC Producer, Nathan Kroll, I can address your questions about the question of the A pitch. Please defer assuming our film audio pitch was High, for it was Not! Mr. Heifetz always had us tune to our own ear for an A (btw, having given each of the 7 of us a perfect pitch exhaustive test w/ just 2 of us possessing perfect pitch - one other & myself) but to the piano A yet insisted the pianist (in our case), Brooks Smith, provide a D Major Chord, Always! Heifetz, unquestionably a Master of pitch & everything else, knew full well the 'side effects' of hearing (what I call a 'Happy A' to a D Major Chord) when tuning to A 440 or 441 ~ In fact, I Never heard Mr. Heifetz speak about 'A = 440 or 441 or 442' or zero!!! His over 40 year piano tuner, Mr. Neblett, was trusted by Mr. Heifetz to provide an A appropriate to Heifetz's sense of concert pitch. Speaking for myself, I've been blessed with a perfect pitch ear, & here's a 'curve ball' for everyone! When studying privately w/Nathan Milstein, he would deliberately lower all 4 strings upon finishing practising for later in the day (w/a block under the fingerboard) to give the instrument (his great Strad) a good rest! Milstein's A was on the 'low' side but tuned, deliberately, within context of each particular work he was performing or recording ... Yet, while studying privately w/him for nearly 4 years in London, I never heard Nathan Milstein speak about, "A = 440, or 441", etc. No such words were ever uttered, folks! Just great ears of either JH or NM, both of whom, trusted this NM 'guinea pig' to be 'in tune'. Intonation is often, as stated by some contributors' above, changed by or 'jacked up' by a recording engineer's dialed speed which raises pitch up & is usually intended to add a "Wow" factor over decades of recording. Yet, what you hear w/ Mr.'s Heifetz & Milstein is a near perfect mirror of what each sounded like within 2 to 3 feet ~ At least I know this having been mentored by both ~ and forever gratefully, to be sure! Kudos to Laurie Niles for providing such an intriguing and ongoing Subject for discussion! December 18, 2017 at 01:59 AM · My violin/viola teacher said she used to tune her viola to A 441 when playing chamber music with violinists who tune to A440 so that her notes played on the G and C would be high enough when played against what the violins were playing. I still tend to tune my violin and viola to A 440 when practicing at home by myself, however. In orchestra I tune to whatever the oboe or concertmaster plays. I don't have perfect pitch and I can't tell the difference between A440 and A441-2 unless I have an electronic tuner with me. Sometimes I do get to orchestra or chamber music rehearsal, though, and find that what I've tuned at home is a hair flat relative to the prevailing A. So it may be that the prevailing A is around A442. December 19, 2017 at 12:09 AM · I tune to 442 to match my teacher. In my ensemble, we match the piano's A and C (different topic). I think he gets the piano tuned to 441, but I haven't verified this. Make a New Year's 2018 Vow to tune as a true professional ~ taking the time to tune & fine tune with your bow in right hand while turning the fine tuner/s on your E & A strings (or, if it be the case at this time, other strings), to avoid any possible dire accident/s. Whether it be a great Strad or newly made modern violin, healthy & professional tuning habits reveal much about players & I dare say, even more about the teaching approach. Determine to be totally dignified & professional on stage & Off stage in the practise room! You will never go back to the bad habit's ~ Make Good habits and Good habits will Make you!! December 22, 2017 at 07:54 AM · How does 448 not harm the violin? You'd think the bridge would be close to snapping, or am I overestimating how high 448 really is? I'm okay listening to 415 for the aforementioned reasons, and also because it's more authentically baroque, but for playing I tune to 441.